Egypt's President Abdel-Fattah El-Sisi met on Thursday with the CEO of the multinational technology giant Cisco Systems and a senior official in the automobile company Mercedes-Benz to discuss pushing investments and cooperation during the upcoming period. 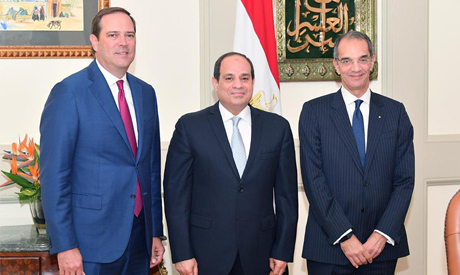 President El-Sisi expressed to Cisco Systems CEO Chuck Robbins his appreciation for the company's efforts in supporting Egypt's transformation towards digital technology through its current investments and training of young Egyptian cadres. Robbins praised the efforts undertaken by Egypt to centralise the role of technology in the process of economic development, as well as improving the investment atmosphere despite the challenges faced by the country in the past few years. The meeting was attended by Minister of Communications and Information Technology Amr Talaat. 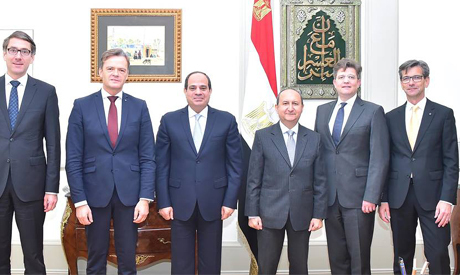 President El-Sisi also met with Markus Schäfer, member of the divisional board and head of the production department at Mercedes-Benz. The meeting was attended by Prime Minister Mostafa Madbouly and the Minister of Industry and Trade Amr Nassar. The president expressed to Schafer Egypt's desire to cooperate with Mercedes in the area of manufacturing self-driving smart vehicles for use in Egypt's new cities, especially the New Administrative Capital. Meanwhile, PM Madbouly attended the signing of a memorandum of understanding between the Ministry of Communications and Information Technology and Cisco Systems, represented by its General Director in Egypt Ayman El-Gohary. The MoU aims to promote digital development and stimulate technological innovation. The MoU outlines the framework for the implementation of the Cisco Context Directory Agent (CDA), which was launched by the global company in the Middle East and Africa two years ago to help countries that are planning to implement digital development plans. PM Madbouly said in media statements that Cisco Networking Academy in Egypt would expand its training capacity to 30,000 Egyptian and African students in 2020. He also announced that Cisco, which has been operating in Egypt for 19 years, would support Algebra Ventures VS with $10 million in addition to launching a cyber security academy in partnership with the National Telecommunication Institute in Egypt.